WILDWOOD – The generous and mission-minded partnership of GNJ churches and leaders with Methodist communities of an African nation and a hurricane ravaged island will forge new disciples of Christ in new and meaningful ways. At the 2018 Annual Conference session of Greater New Jersey, a historic partnership was publicly forged through the signing of a covenant between GNJ and the Methodist Church of Puerto Rico (MCPR) and Tanzania Annual Conference. These missional partnerships will be funded by the Miracles Everywhere Campaign, which seeks to assist Puerto Rico in hurricane relief and train new pastors, build new congregations, and construct a Hope Center for mission engagement in Tanzania. Bishop Hector Ortiz of the MCPR and Bishop Mande Muyombo of Tanzania’s North Katanga Episcopal Region (NKUMC) addressed the GNJ Annual Conference, both celebrating the partnership and commitment to their regions. Ortiz stated how blessed he felt by GNJ’s “radical hospitality” thanking the conference for extravagant generosity, prayers and journeying alongside him and the church in Puerto Rico following the destruction caused by Hurricane’s Irma and Maria. A moving UMCOR video shared images of United Methodists coming to the aide and assistance of their sisters and brothers in Puerto Rico,, bringing many, including Muyombo, to tears. Additionally, three clergy from Puerto Rico whose congregations had been lost or disbanded after the storms will be coming to New Jersey to be a part of and or serve GNJ congregations. “We will be known as those who repair the breach in this two way partnership,” said Schol. Muyombo was moved by GNJ’s commitment to both Puerto Rico and Tanzania. “Bishop Schol and Bishop Ortiz, I love you so much,” Muyombo said when he took the podium. He spoke about how showing God’s kindness in mission is about building relationships. Leaders of Greater New Jersey have already started building this relationship with a six seven member team who left for Tanzania this month to lead the first of a series of pastor schools. The team comprises of Ashley Wilson, Executive Assistant to the Director of Connectional Ministries, Hector Burgos, Director of Connectional Ministries, Lakesha Groover of Covenant UMC in Plainfield, Skylands District Superintendent Steve Bechtold, Sung Hoon Ahn of Ridgewood UMC, Shelley Smith of Ferry Ave UMC in Camden, and Bishop John Schol. The vote to partner was unanimous, and together, both Muyombo and Ortiz joined Schol in a signing of a partnership covenant before the entire body. Many people in GNJ congregations claim Puerto Rico as their homeland. This partnership will engage cross cultural immersion experiences, fostering youth, young adults, laity and clergy leadership exchanges to develop a better understanding of each other’s uniqueness, culture., history, spiritually and ministry. Lay and clergy will explore best practices for growing and strengthening passionate disciples and vital congregations in a multicultural ministry field. MCPR and GNJ local churches will establish church to church companionship relationships to cultivated joint mission opportunities. People will be deployed to mission experiences in both Puerto Rico and GNJ so that both areas experience healing and wholeness from God. The partnership also raises funds through the Miracles Everywhere Campaign to support the recovery, rebuilding and renewal of communities impacted by hurricanes. The North Katanga Episcopal area of the United Methodist Church is comprised of three Annual Conferences: North Katanga, Tanganyika and Tanzania Conferences. The United Methodist mission in Tanzania began 25 years ago with the deployment of six United Methodist missionaries. Through their service and the support of local congregations in GNJ and elsewhere, there are now 68 emerging United Methodist congregations in Tanzania that are growing, both in numbers and impact, in the community. GNJ and the Tanzania Annual Conference will grow their partnership include a pastors’ school in Tanzania to grow the skills of pastors, support pastors’ salaries, start new congregations and support a Hope Center in the country’s capital of Dar es Salaam. The Hope Center will start a health clinic to provide life-saving and preventive care to the community, a primary and secondary school for orphans and host mission teams from around the world. 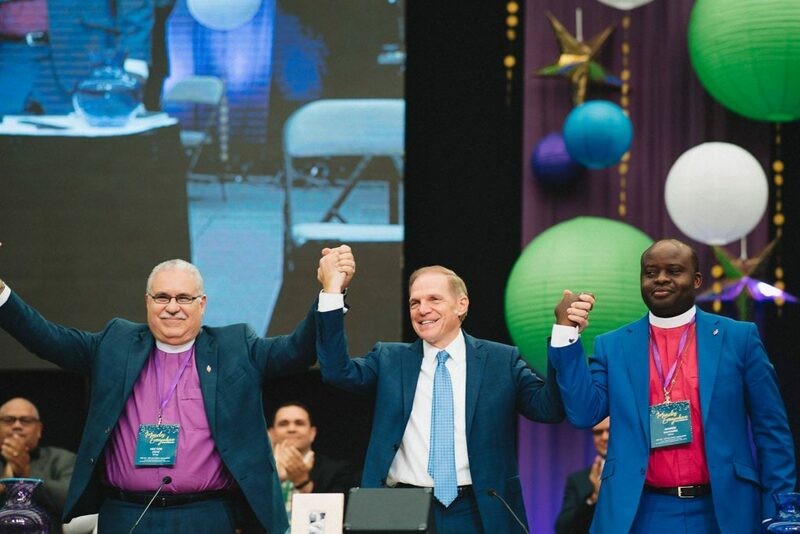 GNJ, Tanzania and Puerto Rico celebrate unique histories and ministries, common Wesleyan heritage and calling to make disciples of Jesus Christ for the transformation of the world. The missional impact of the new partnerships go beyond distance, language and culture.